Luck is in the air all around the ‘verse and, as you gather your closest cohorts for copious merriment, we tip our caps to you and your accomplishments. Here’s to you and new discoveries. Here’s to fate ever smiling upon you. 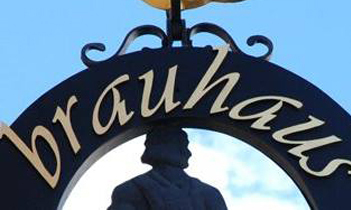 And here’s to the opportunity to commemorate the occasion with friends, frivolity, and frothy beverages. Get in the spirit with limited edition commemorative green and gold vehicles, and show us how you celebrate in a revelrous contest. Raise a glass to another year of revelry, success, and prosperity… just don’t forget to invite us! Throughout the weekend, we want you to share your most outrageous in-game party pics. And the inevitable FOMO of your fellow citizens (assuming they aren’t at your function) is the tip of the iceberg. That’s right, the most provocative party purveyors have the chance to win fabulous prizes. So what are you waiting for? 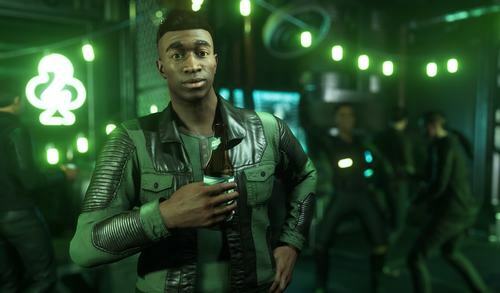 Drape yourself in green and gold regalia, get your groove on, and show the rest of the ‘verse what they’re missing this weekend. Who knows? Fortune could smile upon you. For more details and full contest rules go here. 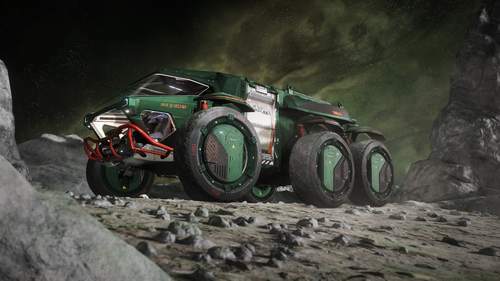 Make your fellow pathfinders green with envy by racing headlong into the unknown in the commemorative limited-edition green and gold Ursa Rover Fortuna from Roberts Space Industries. 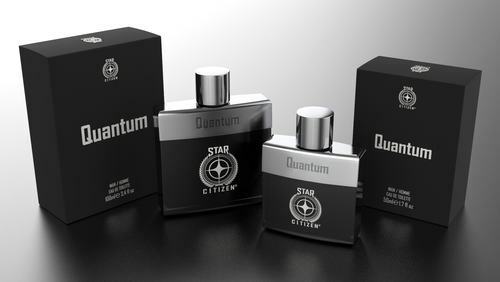 The most trusted name in all-terrain planetside exploration now embodies the essence of good fortune and success. February saw Cloud Imperium devs around the world working hard to deliver the incredible content for the soon-to-be-released Alpha 3.5 patch. 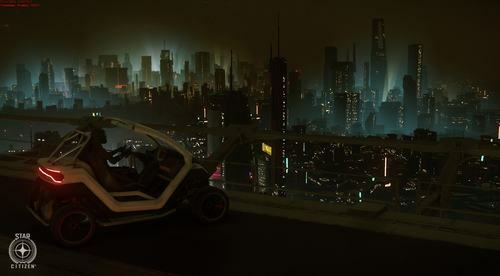 Progress was made everywhere, from locations like ArcCorp to the gameplay developments afforded by the New Flight Model. Read on for the full lowdown from February’s global workload. February’s roundup starts with the AI Team, who made improvements to the existing character collision avoidance system. The changes began with adjustments to the smooth locomotion path, with the data now coming from the collision avoidance calculation to make sure the character has enough free space. Time was spent generalizing the options a vendor can use so that designers no longer have to write them into the behaviors. Instead, the correct options are automatically selected based on the environment and (eventually) from the shop services. They’re also restricting combat behavior to allow better scalability when adding new tactics and are investigating some of the bugs found in the Alpha 3.4 release. Throughout February, the AI Team improved various aspects of dogfighting gameplay, including evasive maneuvers. 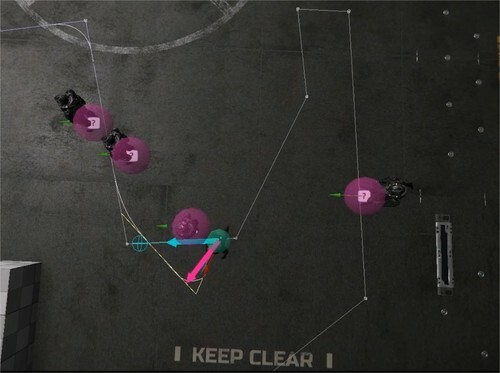 Now, when an AI pilot has an enemy on its tail, it will try to utilize different break-aways with increasing and varied angles. It will also try to keep momentum and chain together attack maneuvers. To achieve this, the team exposed new ‘SmoothTurning’ subsumption tasks to the behavior logic. When detecting enemy fire, AI pilots will utilize evasive maneuvers to create a diversion. They also implemented automatic incoming/outgoing ship traffic over planetary landing areas. They are currently generalizing ship behaviors to enable the designers to easily set up traffic on multiple cities, capital ships, and so on. 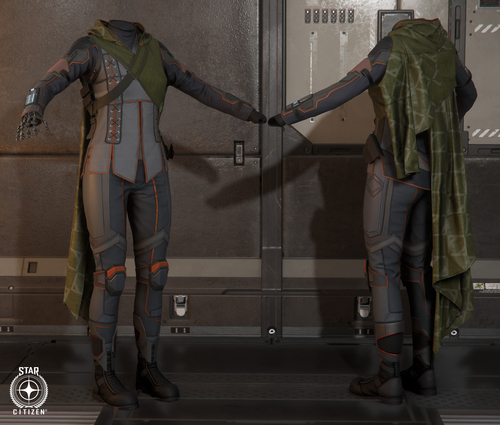 Last month, Animation provided the remaining animation sets for previous characters already found in the Persistent Universe (PU), including Hurston, Battaglia, and Pacheco. They also finished off a new batch of animations for the ship dealer. Work continues on animations for future yet-to-be-announced characters too, which includes getting approval for the initial poses and animations before going forward with the final clean-up. American Sign Language (ASL) emotes are being added to the game and are currently being improved with the addition of facial animations. Tech Art invested significant effort into optimizing rig assets so that they work better with the facial runtime rig logic and the ‘look at’ and ‘mocap’ re-direction components. Since eye contact is one of the fundamental means of human communication, any error or tiny deviation can cause the ‘uncanny valley’ effect and immediately break immersion. So, the alignment of the virtual skeleton’s eye joints with respect to the eyeball and eyelid geometry is of utmost importance. Likewise, the ‘look-at’ system needs to control all relevant rig parameters and corrective blendshapes (not just the rotation of the eyeballs themselves) to create truly-believable runtime re-directions of the mocap animations. Alongside facial work, the team completed several weapons-related tasks, such as fixing offsets during reload animations and locomotion issues for the pistol set. They also completed R&D related to playing animations in sync with character usables within cinematic scenes and helped Design to unify the character tags in Mannequin. 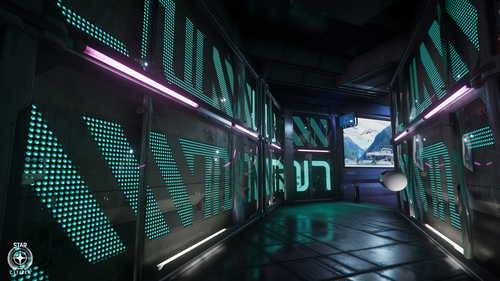 Predictably, the Environment Team is racing towards the completion of ArcCorp and Area 18 – they’re currently working with and implementing the custom advertising provided by the UI department. The planet itself is in the final art stage and now includes skyscrapers rising above the no-fly zone to provide the player with landing opportunities and interesting buildings to fly around. Concurrently, the ‘Hi-Tech’ common elements are steadily progressing, with the transit, habitation, and security areas all moving to the art pass stage. Players will see these common elements (alongside garages and hangars) when they’re added to microTech’s landing zone, New Babbage. The new transit connection between Lorville’s Teasa spaceport and the Central Business District (CBD) is almost ready for travellers. This route will allow players to move directly between the two locations and bypass L19, cutting travel time for high-end shoppers. Work on organics is ongoing, as are improvements to planet tech, with the artists hard at work creating a library of exotic-looking flora to fill the biomes of New Babbage with. Players can see it for themselves towards the end of the year. The community can also look forward to upcoming information on the early work the team has done on procedural caves. Both the Audio Code Team and the sound designers finished their work on the new camera-shake and ship-vibration systems. Now, when an engine kicks in, the ship shakes and hums. This also extends to the player, with events like a ship powering up causing minor camera shake. The sound designers also added new sound samples to a range of ships as part of the rollout of the New Flight Model. By adding ‘one-shot’ samples to each of the various thrusters, they brought out more complexity in the sounds heard during flight. The Audio Team spent the majority of the month creating the sounds of Area 18. 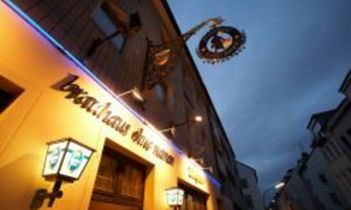 Due to the melting pot of ideas and themes present in the new area, the sound designers tested new methods to bring out the unique atmosphere. 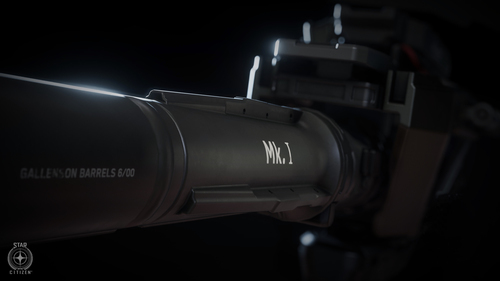 Additionally, they created the sound profiles and samples for the Gemini S71 assault rifle and Kastak Arms CODA pistol, both of which will appear in the PU and SQ42. Currently, the Audio Code Team is working towards an updated tool that better allows the sound designers to implement created assets in-engine whilst simultaneously testing how they sound. Backend Services continued to lay the foundation for the new diffusion network to help scalability for the backend structure of the game. Emphasis is on ensuring the Dedicated Game Servers (DGS) correctly connect to the new diffusion services, particularly the variable, leaderboard, and account services. February marked the near-end of work on the new Item Cache Service (a massive portion of the backend has now turned micro-service) and began the end-point between DGS and this service, too. As work is completed on the new diffusion services, testing will ensure a smooth transition to the new network. Support was also added for subsumption services to read directly into the DataCore P4k system for increased efficiency and unification. With the approaching publish of Alpha 3.5, Backend Services began work on logistics, syncing closely with DevOps to ensure that new services are up and running correctly while maintaining legacy services where necessary. 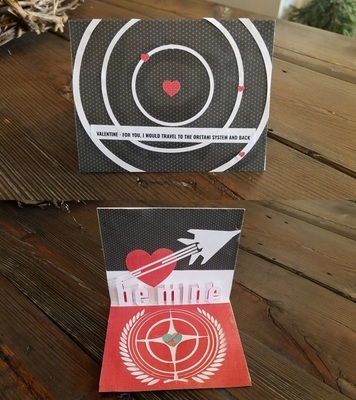 The team celebrated Valentine’s Day with community-made cards and limited-time ship offers, including Anvil’s F7C-M Heartseeker – a special version of the Super Hornet shooting straight for the heart. 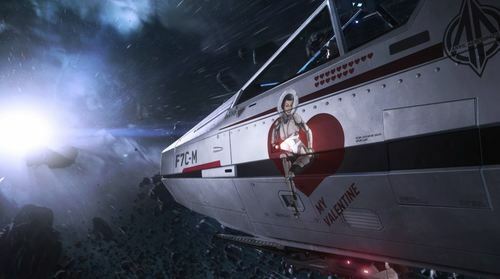 During the Be my Valentine greeting card contest, most Citizens got creative with their favorite image editing software, though some went old-school with scissors and crayons to create fantastic crafts to share their love across the galaxy. 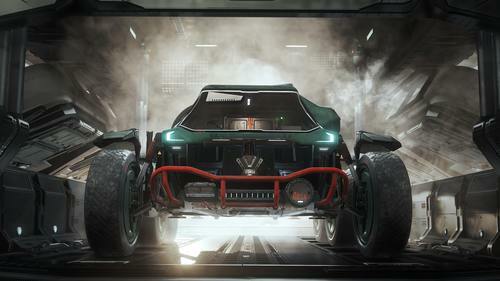 Also this month, Argo Astronautics released their latest addition to the ‘verse, the SRV. The ‘Standard Recovery Vehicle’ is built for tugging ships, ground vehicles, and massive cargo containers through the stars using its integrated tractor tech. If you’re looking for more information about this rough and rugged ship, head to the Q&A that answers questions voted-on by the community. As a bonus, Shipmaster General John Crewe stopped by Reverse the Verse LIVE for some in-depth tug-talk. 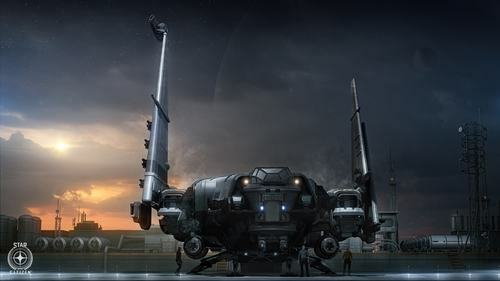 In the February issue of Jump Point (our subscriber-exclusive magazine), Ben Lesnick took a detailed dive into the ARGO SRV’s design process and went on a worker’s tour of Hurston. The Narrative Team also introduced us to the Human holiday Stella Fortuna and shed light on the history of the revered Rust Society. 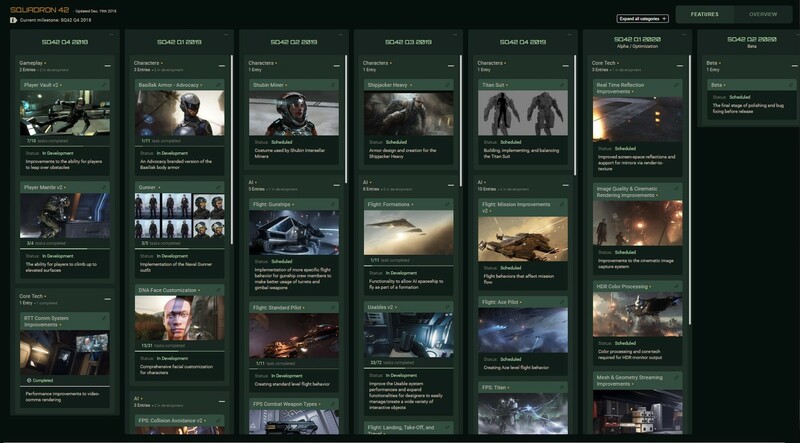 A major update to the Star Citizen roadmap gave a look at what’s coming to the Persistent Universe in 2019 and what can be expected in upcoming releases. 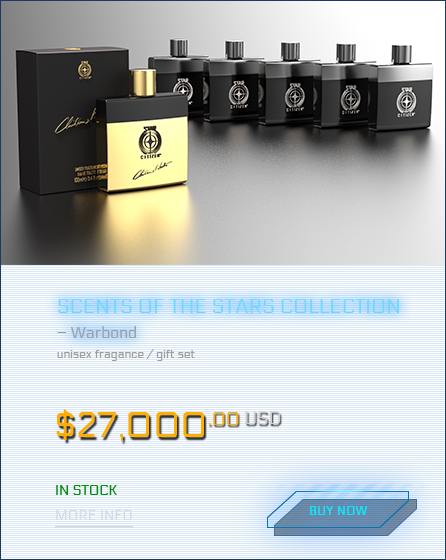 Released in January, but worthy of another mention, is the official Star Citizen Fankit, which was put together to help all of you share your enthusiasm and engagement. 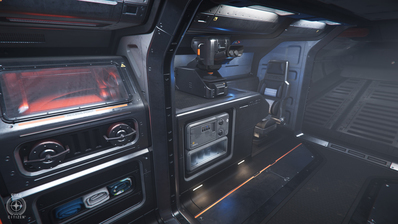 Star Citizen lives by the support it receives from the community, so take a look at this treasure trove of assets and get creating! 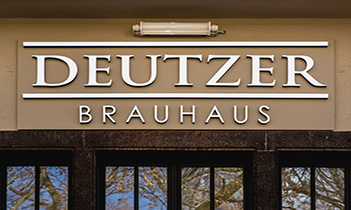 The team is also excited to announce that our physical merchandise will soon be receiving a well-deserved face-lift. Having received a lot of feedback over the years, it’s clear that Citizens are passionate about merch and to make the store experience the best it can be, your input was needed. Thanks to everyone who contributed feedback to our thread on Spectrum! The Character Team revisited the hair development pipeline in February. With the help of the Graphics Team, they developed new tools and shader tech to improve the realism of hair while maintaining quality and performance. More work went into mission-giver Pacheco, including textures and rigging, with her hairstyle being used to trial the new hair pipeline. Work continues on the assets required for DNA implementation and the female player character, while refinement of the Xi’an concept is making great progress. 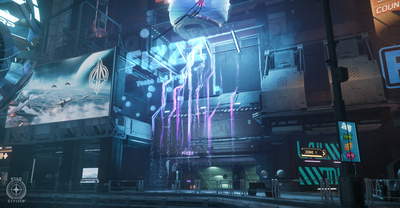 Throughout February, Design focused on implementing Area 18’s shops, NPCs, and usables. Last month marked the end of implementation, with March being used for polish to ensure a believable and immersive experience upon release. The team also gained a new member to help with mission implementation and improvement, who is currently setting their sights on the Emergency Communication Network (ECN) mission set. Regarding the economy, the US Design Team worked with their UK counterparts on the objective criteria and value of objects in-game, laying down the track for acquiring item properties and their values. A system was built to help create an abstract representation, which is both robust and modular enough to allow easy adjustment in the future when the details are finalized. DevOps had a busy month working on the build system and pipeline that supports feature stream development. After several long nights, they rolled out the upgrades and have been happy with the results so far – internal systems are running smoothly without errors and each evolution improves efficiency and storage consumption. They’re now attempting to further compress existing data which, when multiplied by hundreds of thousands of individual files, will make a real impact to the dev’s daily development efforts. February saw the Engine Team spend time on general Alpha 3.5 support, such as profiling, optimization, and bug fixing. They also improved the instance system used in compute skinning and refactored it on the CPU and shader for better maintainability, created a budget-based output-buffer system for skinning results (so they only have to skin once per frame), made more tangent reconstruction optimizations, and worked on wrap-deformation using the color stream. Basic HDR display support was added to the editor, as was a new hue-preserving display mapping curve suitable for HDR display output. The team provided material layer support for planet tech v4 and continued to improve character hair, which included initial hair mask, support for edge masking, and pixel depth offset. Game physics is progressing with Projectile Manager 2.0, as well as optimizations to wrapped grids and state updates. Support was added for ocean Fast Fourier Transform (FFT) wave generation to physics buoyancy calculations, as well as exposed optimized terrain meshes. A major system initialization clean-up was completed as part of an initiative to share core engine functionality with PU services, work began on the lockless job manager (a complete overhaul for faster response in high-load scenarios), and a new load time profiler was created. The team are currently wrapping up the ‘ImGUI’ integration and introducing a temporary allocator for more efficiency when containers are used on stack. 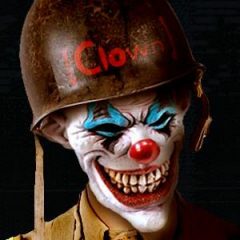 They made the switch to the Clang 6 compiler to build Linux targets (including compilation cleanup of the entire code base) and plan to switch to the latest stable release (Clang 8.x) in the near future. Finally, they finished a ‘create compile time’ analysis tool (utilizing new Visual C++ front and backend profiler flags) to gather, condense, and visualize reasons for slow compile and link times. As a result, various improvements have already been submitted and further action-items defined. A large portion of Gameplay Feature’s month was dedicated to implementing the new DNA feature into the character customizer. In addition, the team was responsible for creating and setting up the user interface (UI) and accommodating the female playable character, both of which are scheduled for Alpha 3.5. Another major focus was on video streaming for comms calls, which consisted of a refactor of the comms component to utilize the voice service call mechanism. Research was made into the VP9 streaming format and video streaming improvements were completed that will be rolled out in the upcoming release. Lastly, support was given to the US-based Vehicle Features Team, with updates to the turret sensitivity HUD, gimbal assist UI, and the shopping service entity registration. Gimbal Assist and its related HUD improvements were finalized and polished, allowing for better balancing of this new weapon control scheme. Turrets were also improved, as the team added a HUD and keybinds for input sensitivity, implemented adjustable speeds for gimbal target movement based on proximity to center aim, and fixed bugs with snapping and erratic movement. A lot of work went into scanning improvements, which included adjusting the area for navpoint scanning, enabling use of the navpoint hierarchy, and adding a Boolean to opt into the scanning data. This endeavor also covered adjustments to make scanning more involving by setting up AI turrets to generate signatures and be scannable and adding specific icons for scanned/unscanned targets. Ping and blob were implemented to display on the radar too, including focus angle and ping fire. To round out the month, they continuing to make item port tech optimizations, developed tech for utilizing geometry component tags in the paint system, and fixed a handful of crash bugs. Last month, the Graphics Team’s work on the PU was spread between several smaller tasks. 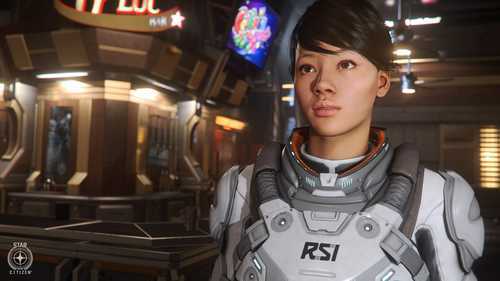 There were many shader requests from the artists, such as adding new features to the hard surface shader and ISO support for decals in the forward rendering pipeline. The team also continued with the CPU optimizations from last month. This included a 3x performance saving on the cost of building per-instance data buffers for the GPU and better support for the depth pre-pass to help occlude hidden parts of the frame with less CPU overheads. To help the artists optimize their content, the team worked on an improved render-debugging tool that reports how many draw instructions (draw-call) a particular object requires along with a breakdown of why each instruction was needed. Once complete, this will allow the artists to dig into their material and mesh setups to save valuable CPU time. The Level Design Team soldiered on with ArcCorp’s Area 18, bringing the designer whitebox up to greybox. They began planning the modular space stations that will be built this year too, including looking at the libraries, rooms, and content that goes into them. 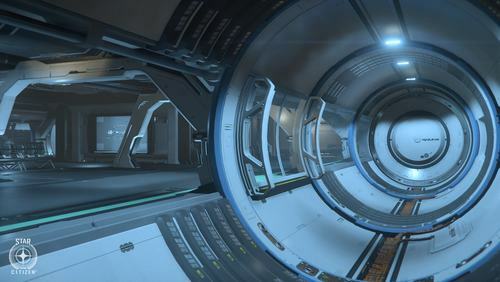 The procedural tool is also now at a stage where they can slowly start ramping up the modular station production. The Live Team refactored existing missions to make them scalable to make more content available in the planetary system (other than Crusader). 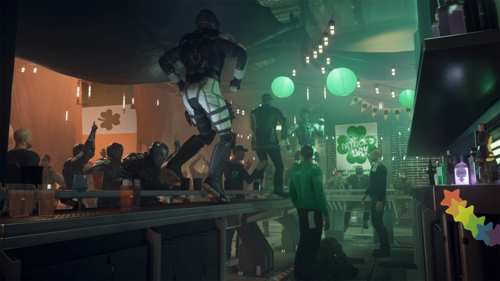 Significant progress was made on a new drug-stealing mission for Twitch Pacheco, as well as a BlackJack Security counter-mission that tasks less morally-corrupt players with destroying the stash. Another focus was on implementing a variety of encounters with security forces and bounty hunters when the player holds a high crime stat. As well as practical work, time was taken to define the next tier of many aspects of the law system, such as punishment, paying fines, bounty hunting, and so on. 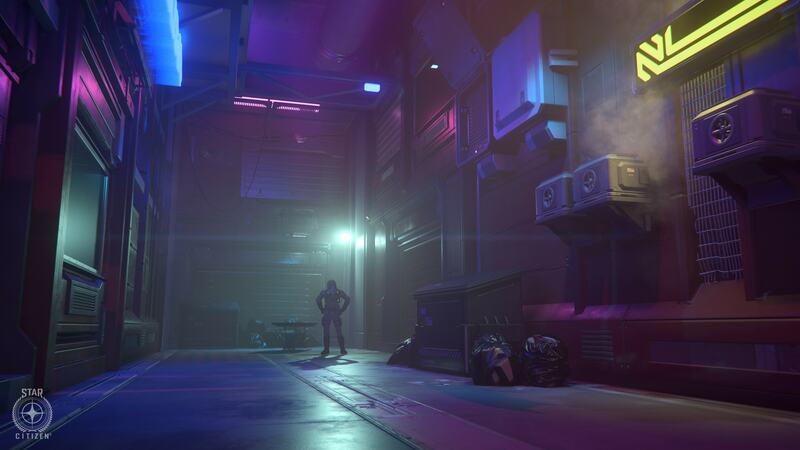 Last month, the Lighting Team focused on developing the look of Area 18. Lighting Area 18 is a mixture of clean-up work from the previous versions to match new standards and lighting the new exterior layout to a series of targets set by the Art Director. The team is working closely with the Environment Art and VFX teams to ensure that new advertising assets and visual effects ‘pop’ from the environment and provide interesting and varied visuals. Working closely with the Environment Art and Mission Design teams, February saw the Narrative Team further fleshing out of lore relating to ArcCorp and its moons. From new mission giver contract text to the catchy slogans gracing Area 18’s numerous billboards, a lot of additional lore was created to bring these locations to life. Additionally, expanded wildline sets for security pilots, bounty hunters, and combat assist pilots were scripted and recorded. The AI and Mission teams will use these sets to begin prototyping and testing out new gameplay for inclusion in future builds. Also, the Narrative Team made progress on generating the specific text needed for on-screen mission objectives. Currently, this is placeholder text from the designers who worked on levels, but moving forward, the hope is to begin using the proper in-lore objectives. 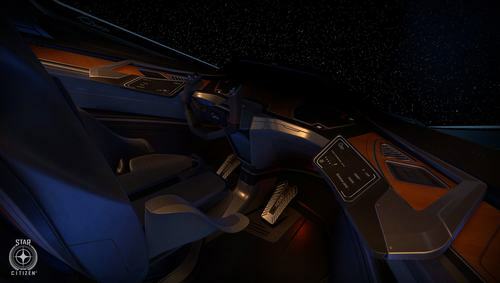 The Player Relations Team was busy preparing for Alpha 3.5 (including getting ready to test the New Flight Model) as well as boxing off the work created over the holiday period. 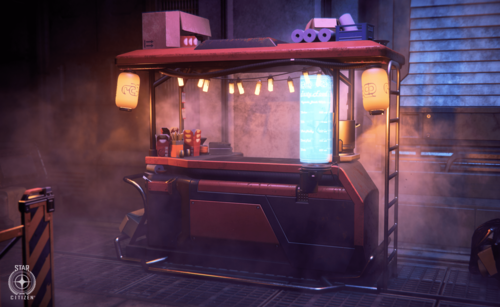 February saw headway into Area 18’s props: the core street furniture is now in and the team has moved onto the dressing pass, adding in new assets to give life to the streets, alleyways, and landing zone. As the month closed out, the team jumped into release mode to get a head start squashing bugs and generally tightening up the upcoming release. 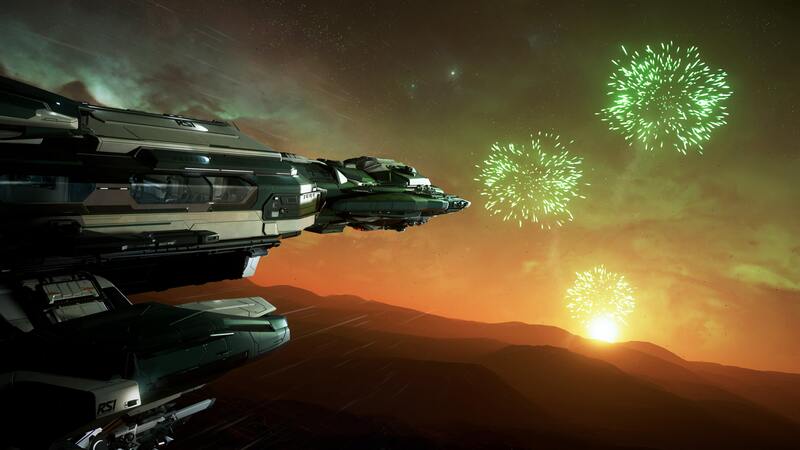 Things ramped up on the publishing side in February as the team prepared Alpha 3.5 for the Evocati and PTU. Testing continues on the New Flight Model and other systems as they come online, such as the new weapons, ships, and locations. QA leadership continues to train the newer testers and improve the overall testing process. The AI Feature Team kept the Frankfurt-based QA testers busy with new features, such as the improved avoidance system and new break-away maneuvers. Testing mainly consists of making sure they’re working as intended, as well as noting visible improvements to what was already in place (in the case of the avoidance system). 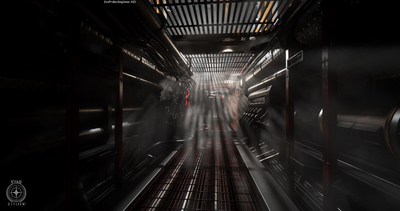 Combat AI received perception updates which were tested by QA to address issues where the FPS AI would not recognize the player being present in their vicinity. On the backend, changes to the subsumption visualizer are being tested to ensure no new issues have been introduced in preparation for their full integration into the editor. Testing for ArcCorp and Area 18 is currently underway too. The Universe Team discovered that mining entities were not appearing in the client due to discrepancies in how they were spawned in the server. This was tracked down and fixed, though testing will continue to make sure it’s working as intended. 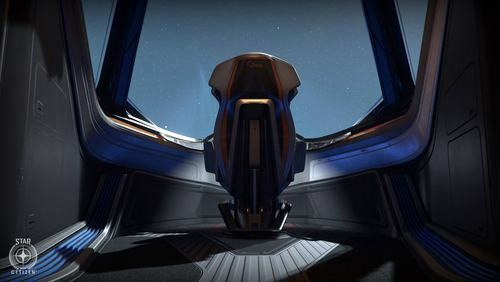 The Vehicle Content Team wrapped up the MISC Reliant Mako, Tana, and Sen variants for Alpha 3.5. They’re now in testing with QA who are addressing bugs before the vehicles go live. The designers and tech artists have been busy with the Origin 300i, which will reach QA for testing in the near future. 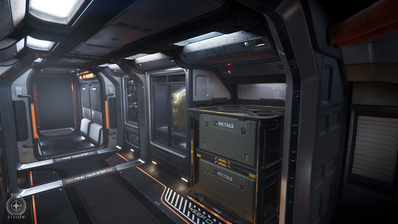 Back in the UK, the team continued production on the 890 Jump, bringing more rooms into the final art stage from greybox (including the hangar area). 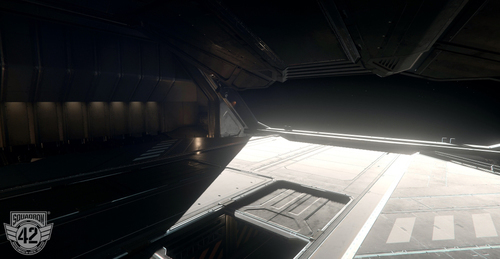 The Carrack is heading towards a greybox-complete state and select areas are being polished for review. 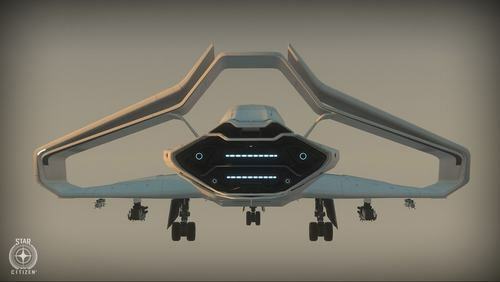 Development continues on the Banu Defender which is utilizing a new style of production that caters to its organic art style. ZBrush is being used to sculpt the interior before transferring the high-density model to 3ds Max, where it is then rebuilt (low-poly) for the game engine. A large portion of the exterior greybox is complete and looking fantastic. Last but by no means least, the interior updates to the Vanguard wrapped up with essentially the entire area from the cockpit seat backwards being completely redone. This is more than was initially anticipated, but the team feels that it’s worth it. Now that the interior rework has been finalized and the framework for the variants agreed upon, the Ship Team can start on the exterior changes to accommodate them and continue with the variant-specific items. The System Design Team is working on improving and upgrading the no-fly zones used across ArcCorp. Since the existing system now needs to support an entire planet, it has proven quite a challenge. For social AI, the team’s working on unifying vendor behaviors and making sure they’re built in a modular fashion. For example, the team can easily graft new actions onto the base behavior of a shop keeper to allow them to pick up objects, give them to the player, and interact with things on the counter without having to build new ones from scratch. 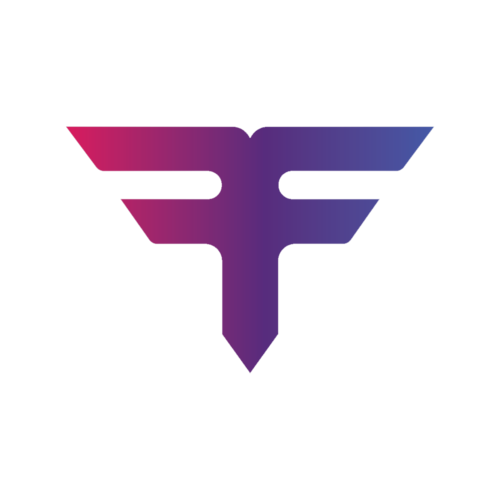 As with social AI, the team focused on restructuring FPS AI behaviors to make them more modular, with the goal to make it easier to implement specific chunks of logic. For mining, they added new mineable rocks on ArcCorp’s moons. Wala in particular will have a new type of rock that fits better with the crystalline formations available on the moon. Finally for System Design, AI traffic over Area 18 is currently being developed. The team’s starting small, with a few ships landing and taking off around the spaceport, but they’re also investigating ways to expand it while being mindful of performance. RSI Platform: On February 14th, Turbulent supported the announcement of a new flyable variant of the Super Hornet, the F7C-M Heartseeker. They also made major updates to the CMS backend which required all hands on deck. Services: This month’s game service work was focused around developing support for transporting video streams over the comms channels. This will allow the streaming of a user’s face/in-game texture to another player outside of the bind culling bubble, enabling in-game video calls over wider distances. This method also enables the transmission of in-game video streams to web clients. Turbulent spent considerable time standardizing services to enable them to run within a new local development environment.  This will allow the entire Star Citizen universe’s services to run locally on dev systems to develop and iterate with the entire stack. 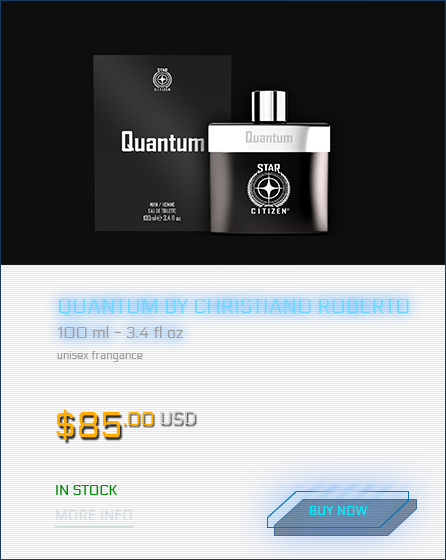 The Turbulent Services Team also began work on an administration interface for game designers and game operators to display real-time information about the state of the universe. 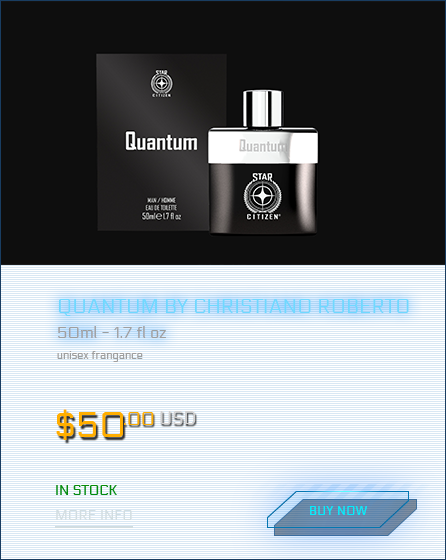 This application can display information about groups, lobbies, and voice channels along with details of online players, quantum routes, and probability volumes. 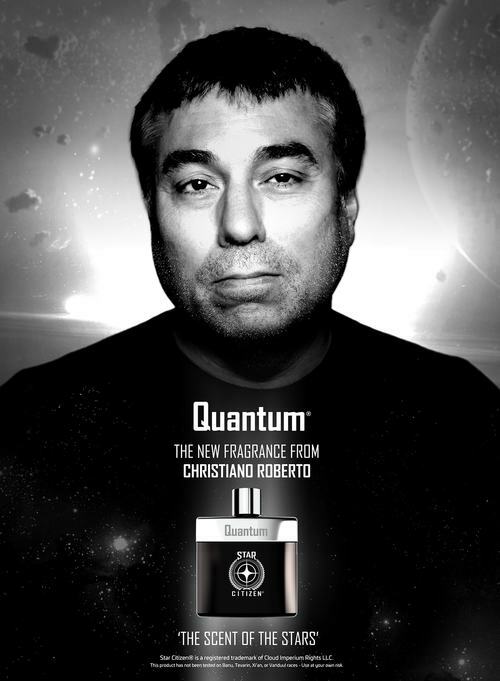 As in January, UI supported the Environment Team with in-fiction advertising and branding for Area 18, including animation and hologram textures. They also made headway on the 3D area map using the concepts shown last month as visual targets. Finally, they began working out how to bring the rental functionality from the Arena Commander frontend to in-game consoles in Area 18. 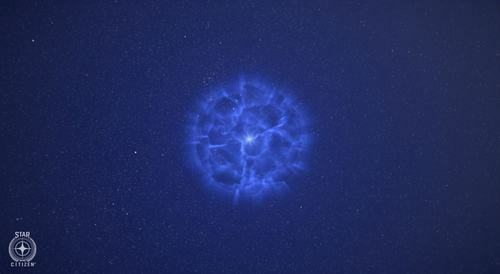 The VFX Team updated the existing particle lighting system to a more modern system. The previous version was based on tessellation, which increased the rendering cost and had limitations on shadow resolution. The new one is a global change that will remove the need for tessellation and improve shadow receiving for crisper, smoother shadows. ArcCorp’s Lyria and Wala will be the first moons to use this new particle lighting system when it’s ready for deployment. 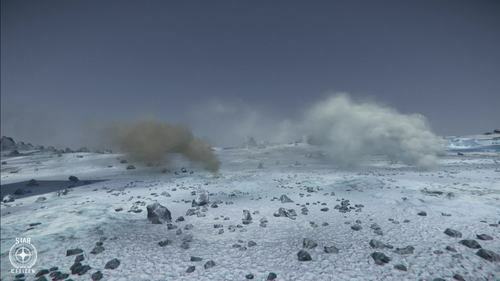 It will help the particles integrate into the moons more realistically and address issues when the particles have long shadows going through them, such as during sunrise and sunset. 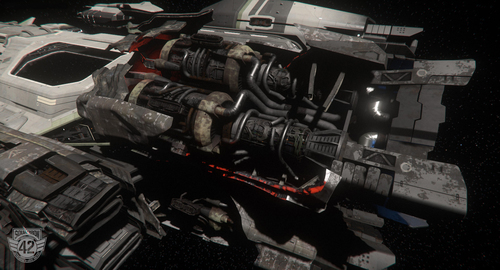 They also continued to iterate on thruster damage effects and began rolling it out to all ships. Several new weapon effects were worked on, including a new ballistic hand cannon and ballistic assault rifle. They also carried out extensive visual exploration for the new Tachyon energy weapon class. Finally, significant time was invested in improving the VFX editor’s UI layout and functionality. Although not as glamorous as planet dressing and effects, improving the quality-of-life for artists is important and helps them to work faster too. 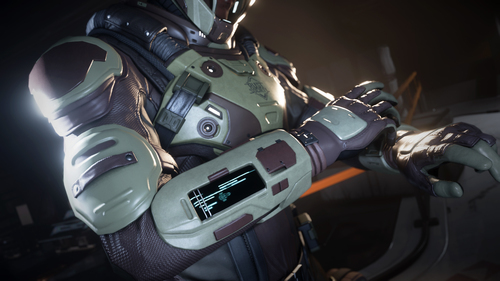 Centurions will receive the RSI Venture Rust Society Arm Armor. 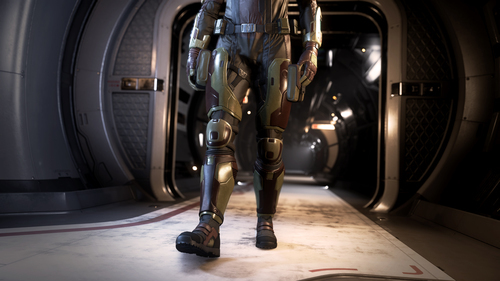 RSI’s Venture is a lightweight armor set built for the unknown. This EVA-rated protection system features an undersuit built from a durable polymer weave that’s designed to withstand extreme environmental conditions and features component armor pieces to protect you against impacts and particulates. The Rust Society edition adds a red and tan color scheme so you look good while working hard. 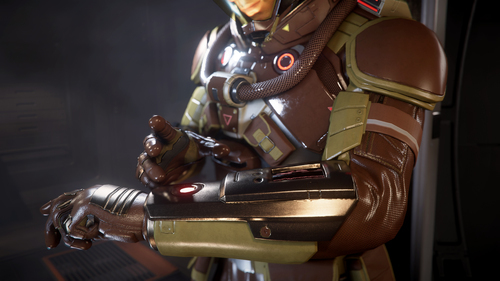 Imperator-level subscribers get the RSI MacFlex Rust Society Arm Armor. 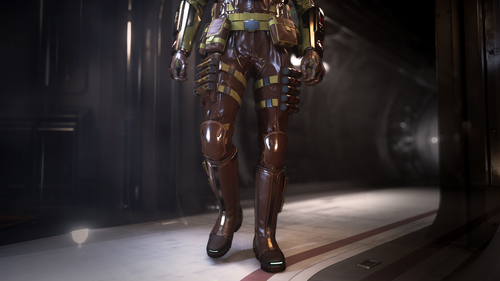 Whether you’re planetside or in vacuum, RSI’s MacFlex industrial armor set has your back. 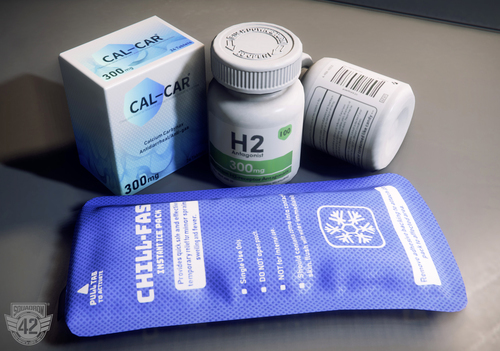 Reinforced plating keeps you safe from environmental hazards while the array of pouches keep your tools accessible. The Rust Society edition celebrates blue-collar workers with an exclusive red and tan coloration that hides dirt and wear and tear well. If you’re an active subscriber, these items will be added to your account on March 18th. If you aren’t a subscriber but want to sport these gauntlets, make sure you subscribe no later than March 17th.